Step Into Amazing with three action-packed films in 4K Ultra HD with HDR. BATMAN V SUPERMAN: DAWN OF JUSTICE ULTIMATE EDITION � Extended cut of the film with 30 more minutes not seen in theaters. 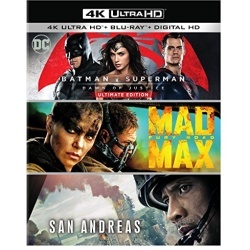 Fearing the actions of a godlike super hero left unchecked, Gotham City�s formidable vigilante, Batman (Ben Affleck), takes on Metropolis� revered savior, Superman (Henry Cavill), while the world wrestles with what sort of hero it really needs. Theatrical Version on Blu-ray Disc�, Extended Cut and Theatrical Version on Digital HD. MAD MAX: FURY ROAD � Director George Miller, originator of the post-apocalyptic genre and mastermind behind the legendary Mad Max franchise, returns to the world of the Road Warrior. Haunted by his turbulent past, Max Rockatansky (Tom Hardy) wanders alone until he�s swept up with a group, led by Imperator Furiosa (Charlize Theron), fleeing across the Wasteland. In hot pursuit: a warlord who gathers his gangs and pursues the rebels ruthlessly, leading to a high-octane road war. SAN ANDREAS � After the infamous San Andreas Fault gives, triggering a magnitude 9-plus earthquake in California, a search and rescue helicopter pilot (Dwayne Johnson) and his estranged wife (Carla Gugino) make their way together from Los Angeles to San Francisco to save their only daughter. But their treacherous journey north is only the beginning. And when they think the worst may be over... it�s just getting started.